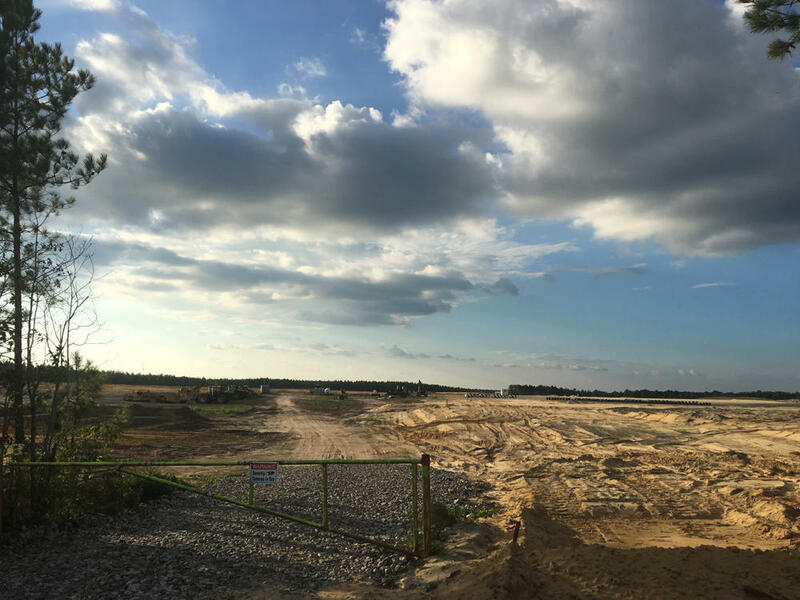 An Enviva wood pellet plant in Northampton, N.C.
A biomass fuel plant that processes tree scraps into wood pellets has some North Carolinians concerned about its potential environmental and health impacts. Maryland-based Enviva will soon open its fourth wood pellet plant in the southern part of the state. The new plant will be just outside the small town of Dobbins Heights, where roughly 85 percent of residents are African American and the median household income is $21,000. 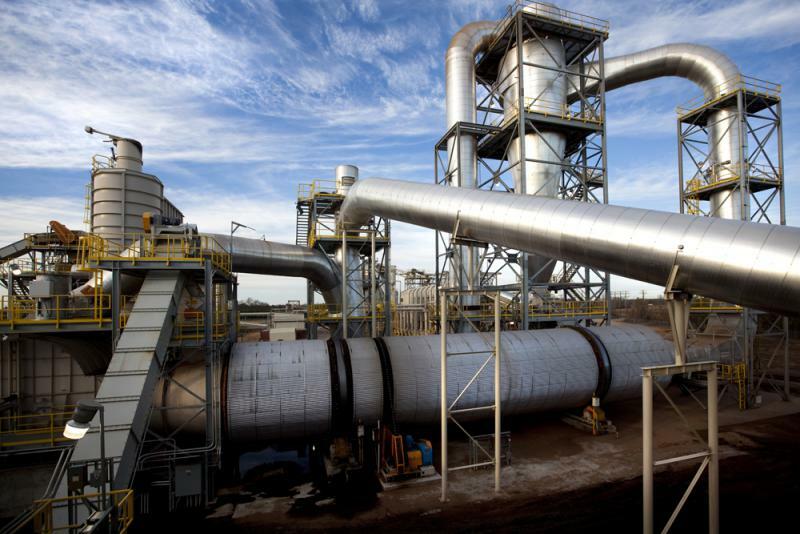 James Morrison reports on a controversial Enviva wood pellet plant in Dobbins Heights. Longtime Dobbins Heights resident Debra David is afraid the plant will add “hundreds of thousands of tons of pollutants each year” to the air around her town. On a recent afternoon, she stood on the side of Highway 177 at the site of what will soon become the Enviva plant. The new Enviva plant will take a mixture of hard and softwood trees from the surrounding forests and process them into wood pellets that are burned as an alternative to coal. The United Kingdom is the main purchaser of the pellets as a means to transition itself entirely off coal by the year 2025. But a growing number of European and Asian countries are also switching from burning coal to wood fibre. 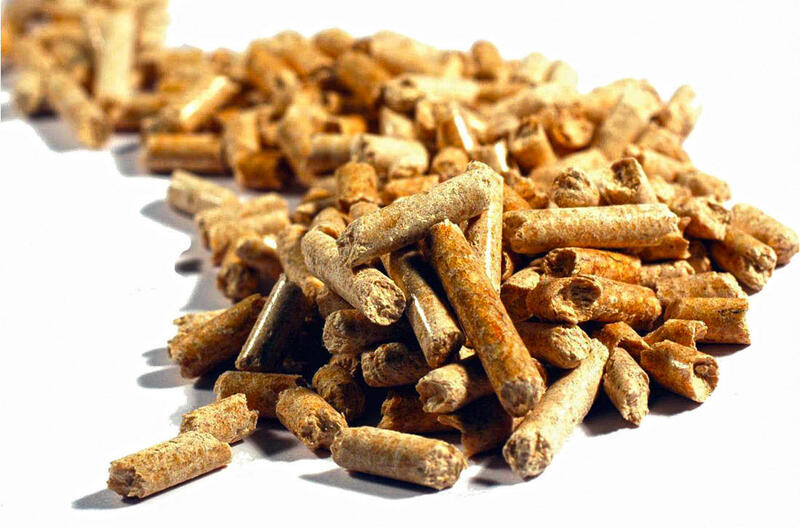 Most of the UK’s wood pellet supply comes from the southern United States, including North Carolina. David and other Dobbins Heights residents fear their community will bear the brunt of the environmental impacts and see little of the economic benefit. She recently joined a group called Concerned Citizens of Richmond County, which has aligned itself with the environmental advocacy group Dogwood Alliance. 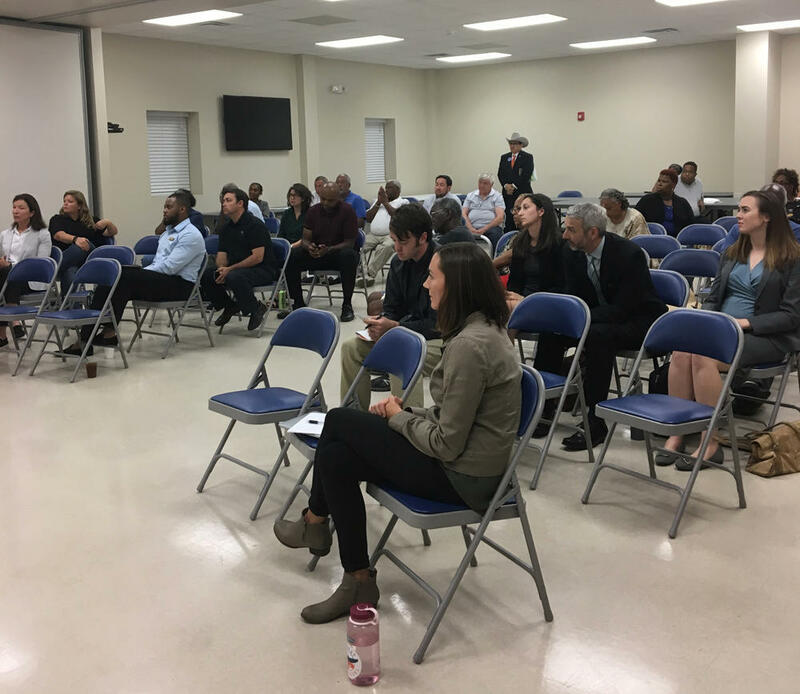 The two groups hosted a forum at the Dobbins Heights Community Center on a recent evening to offer residents an opportunity to express their concerns about the plant. Some residents welcomed the plant and the jobs it would create. “We need jobs. If we don’t have jobs we’re going to have robberies. Welcome Enviva,” said lifetime Dobbins Heights resident Edward Tender. Others worried about the health impacts. “I have family members that have asthma. I have family members who have cancer. I don’t know what’s going to happen when the plant is open. I’m here because I want to know more about it,” said lifetime Dobbins Heights resident Catherine York. Dobbins Heights residents attended a community forum recently to express their concerns about the Enviva plant coming to town. Others welcomed the plant and the jobs it would create. Richmond County is one of the least healthy in North Carolina, with a higher rate of chronic respiratory disease and asthma than the state as a whole, according to data compiled by the Robert Wood Johnson Foundation and the University of Wisconsin. Now, Concerned Citizens of Richmond County, represented by the Southern Environmental Law Center, are suing the North Carolina Department of Environmental Quality, claiming the agency didn’t provide proper public notice before issuing air quality permits for the Enviva plant. The initial public notice had an incomplete address and the following notice had the wrong zip code. But Richmond County commissioners, who have been working for years to bring the plant to the area, argue it’s been discussed publicly and regularly since it was first proposed in September 2013. Richmond County Commissioner Ben Moss called the lawsuit “a last ditch effort” by outside environmental groups. Construction is underway at the site of a future Enviva plant in Dobbins Heights. It’s expected to be finished by the end of 2018. The commissioners said the site was chosen because it’s in an industrial area close to a highway, a rail line, a port and a sizeable labor pool. Enviva promises to create 80 jobs that will pay nearly $40,000 a year. Training for the jobs will be based at Richmond Community College, which is less than two miles from Dobbins Heights, and locals will be given hiring priority, company officials say. The company estimates the plant will bring around $23 million in economic development to the county through taxes and by contracting with local tree growers and transportation companies. Enviva has also demonstrated its ability to meet air quality compliance standards at its North Carolina plants in Ahoskie, Roanoke Rapids and Faison, according to DEQ measurements of harmful, airborne particulate matter, known as PM 2.5. “The levels reported by the state at our facilities show that we are not contributing to any increase and those air levels are in compliance,” said Rob McCulloch, stakeholder engagement manager for Enviva. But health advocates argue that compliance doesn’t mean healthy. In fact, Richmond County’s respiratory health problems could be linked to poor air quality, even if it’s within state and EPA guidelines, according to Lawrence Raymond, a physician and a former state environmental management commissioner. He’s currently chair of the Medical Advocates for Healthy Air. “Recent research publications appear to show that there is no safe threshold for what we call PM 2.5 -that is fine particulate matter- in the breathing air,” he said. Raymond highlighted a new study in the New England Journal of Medicine that shows African Americans have the highest rate of death associated with exposure to fine particulate matter. He said people in Dobbins Heights may be in the middle of a Faustian bargain, having to choose between health and economic prosperity. The Concerned Citizens lawsuit is expected to go to court in late November. Construction has begun at the Enviva plant. It’s expected to be finished by the end of 2018. Enviva, the embattled wood-pellet manufacturer, has announced a $5 million conservation program designed to save some of North Carolina’s environmentally sensitive forests. Enviva has been under fire from critics for using whole hardwood trees to make the majority of the wood pellets it produces, instead of wood waste. At its two plants in North Carolina, more than 85 percent of the wood comes from hardwood trees. 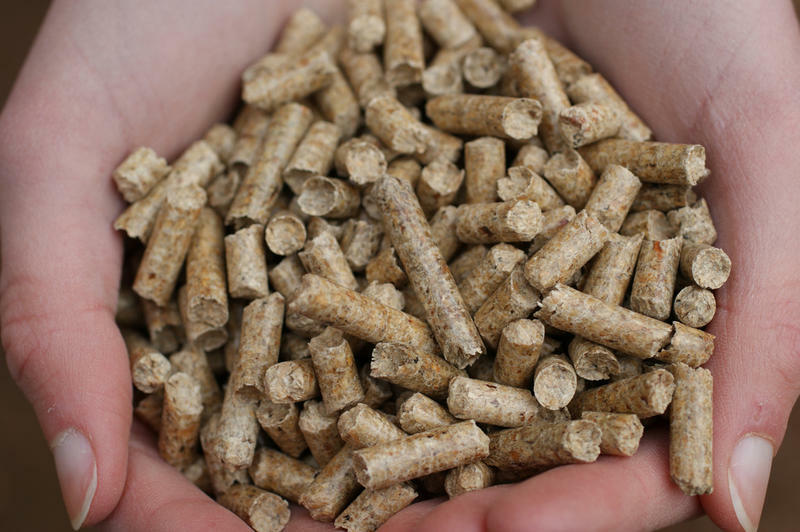 The wood pellet industry is booming in North Carolina, thanks in part to high demand from Europe. 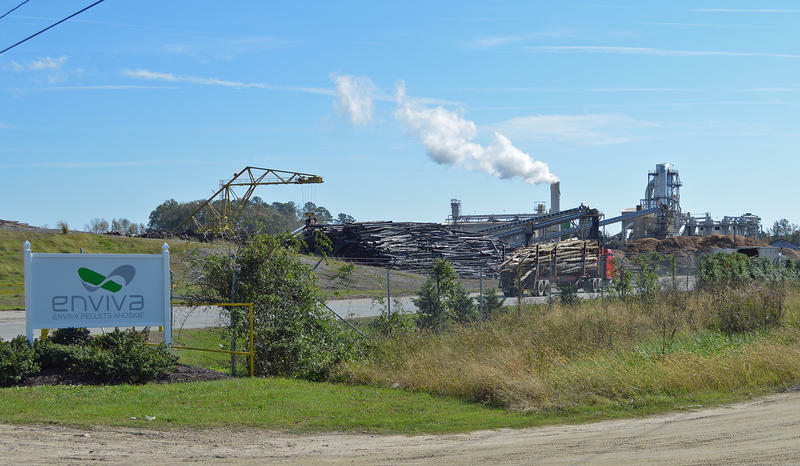 Power plants burn the wood product to create energy, but wood pellet companies are cutting down trees at a higher rate than anticipated, raising questions about whether the practice really is carbon neutral. 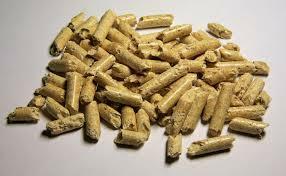 The Wood Pellet Industry In NC: Economic Boon or Climate Disaster? Trucks carrying long logs stream into the wood pellet plant on the edge of Ahoskie all day, every day. The facility, owned by a company called Enviva, was an abandoned saw mill just five years ago. Now, it towers over the adjacent Wal-Mart and Hardees, spewing white smoke. Along the fence that encircles the plant, logs are stacked 40-feet high. Longleaf pine, southern red oak, white ash - pretty much every tree species that grows in the southeast could be used to make wood pellets. The European Union recently set an aggressive goal for 20 percent of its energy to come from renewable sources by 2020. They turned to the American South as the primary supplier of wood pellets, a renewable alternative to coal. But some environmentalists claim pellets are not a viable carbon-neutral resource and the pellet industry is fostering environmentally hazardous logging practices.